PODERE LA VILLA is one of the most charming typical Tuscan houses of the area. It is located in the hilly Chianti countryside, just a few minutes outside of San Casciano where there is a large grocery store, as well as a pharmacy, shops and restaurants. It is an easy drive to Florence (15 Km), Siena (60 km), and Pisa (70 Km). From here you can easily get to San Gimignano, Volterra, Certaldo, and many other fascinating local villages. Podere la Villa is ideal for anyone looking for a relaxing and peaceful place in the heart of the Chianti Classico wine region. There are a number of easy, beautiful hikes to take directly from our property that take you through vineyards and wooded areas. Or, just relax at home in one of the many lovely eating/lounging areas, or by the panoramic pool (open mid May to mid October). It is especially gorgeous here both in the Spring and in September-October during harvest. - a living and dining room with fireplace, TV, DVD, stereo, and WIFI. - a bedroom (sleeps 2 in a queen bed) with a brand new bathroom with shower. - a terrace shaded by a pergola, furnished with tables, chairs and BBQ. - one large bedroom (the king size bed can also be converted into two large twin beds), a bathroom with shower. Air conditioning. - one bedroom with two separate twin beds, a bathroom with shower. Air conditioning. Swimming pool - Parking area – Garden - Patio. This villa is our home, and we care for our guests like extended family. Since 2005, we have enjoyed meeting interesting guests from all over the world. We are happy to share our knowledge of the local area with you, as well as learn about your background and exchange ideas. Your children are very welcome to play with our children, too! The house has a large garden on several sides with various corners for sitting and reading, watching the sunset, and easy access for taking walks in the vineyards. Upon your arrival, we will welcome you with a bottle of our wine made from our own vineyards as well as our own olive oil. We will also furnish the kitchen with some basic things for breakfast. During your stay at Podere La Villa, upon request, we can arrange a typical Tuscan dinner prepared by a local chef, and/or a wine tasting of some famous Italian wines. If you like our wine, you are certainly welcome to take some home with you. We can arrange for packing and shipping. For stays longer than a week, a weekly cleaning with change of linens and towels is included in the price. A laundry room is accessible from the external part of the villa. Extra maid service or babysitting can be provided upon request. WHY I LOVE THIS SPOT: Podere La Villa is situated in a gorgeous Tuscan valley where the sometimes lush, sometimes rugged landscape alternately recalls renaissance paintings by masters such as Leonardo da Vinci or Benozzo Gozzoli. Despite the quiet, rural feel, we are very strategically located, just 15 km from Florence. The estate has a total of 10 hectares (25 acres), which include vineyards, olive groves, woods and a small lake. The 7 hectares (17 acres) of vineyards are in the Chianti Classico wine region and comprise Sangiovese grapes (80%) and Merlot grapes (20%). We have adopted sustainable farming techniques, although we are not yet certified as organic farmers. Our goal is to respect and preserve the surrounding environment as much as possible. All our grapes are hand-picked and produced in limited quantities to obtain the best quality. We make our own wine from the 2 hectares (5 acres) of vineyards alongside the Villa, as these grapes receive the most sunlight. We sell the remaining grapes to other Tuscan wine estates. We love this land, our roots are very deep here. We like to share all this with our guests and friends. In this very unique corner of Tuscany, twenty minutes South of Florence, among gorgeous views and colors, we offer you a very special stay off the beaten tracks of touristic routes. A very charming and spacious unit of about 200 square mters in a refurbished farmhouse situated near the town of San Casciano (18 Km from Florence, 60 km from Siena, 70 Km from Pisa) in the heart of the Chianti Classico area. Podere la Villa is an ideal stay for for anyone who would like to spend a relaxing and peaceful time "far from the madding crowd". It is also a perfect spot for family reunions and for family with children. Podere la Villa is located near Florence and Siena and close to the numerous and fascinating Tuscan towns such as San Gimignano, Volterra and all the little villages of the Chianti Classico area. Interesting and facinating walks all around the property are possible all year through, especially recommended during the harvest time – September and October, and in the Spring time. The villa is extremely well positioned, furnished and equipped. Guests particularly appreciate that there are several areas to eat / relax which make the villa very flexible. A beautiful swimming pool has been built in one of the most panoramic areas of the estate, which is open from mid May until Mid October. VIEW - QUIET PLACE - OFF THE BEATEN TRACK - WE PROVIDE MANY INFORMATION - GREAT WINES ON THE PREMISES - BEAUTIFUL POOL. It was a very nice experience to get to know you and your family and to accommodate you at PODERE LA VILLA. Should you like to come back again one day you will be more than welcome! I can't say enough great things about Podere La Villa and its lovely owners! The property was beautiful and so comfortable. But the best part was the stunning hilltop views of the vineyards and the rolling hills of Tuscany! The owners, Ilaria and Raf are the nicest and most helpful people we've met on our many travels and stays at different properties. They treated us like good friends from day one, showed us how they grow their vines and take care of the property, suggested great restaurants and places to visit. 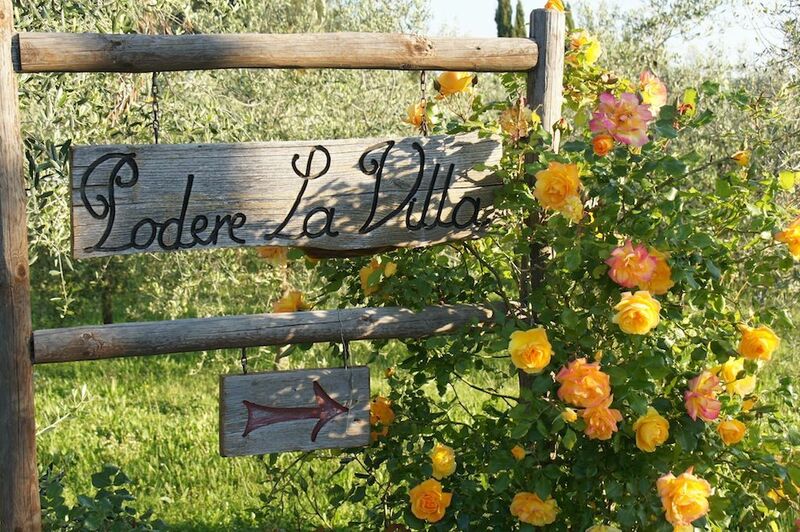 We can't wait to come back to Podere La Villa, which is a truly magical place! Highly, highly recommended! It was our greatest pleasure to share our home with you. We hope we were able to communicate the spirit of our place, of our culture and unique territory. You are really welcome to come again. I will soon send you the recipe of CONIGLIO ALLA CACCIATORA for your father! We cannot say enough about our week at this Villa - very comfortable, spacious, well appointed and maintained. And the family that owns the Villa (who lives on the property) could not have been more helpful, warm, inviting, and interested in our stay being a great one. We'd wake up and have breakfast on a patio overlooking the countryside/vineyards (the Villa has it's own vineyard as well! ), the only noise being the wind, a dog or rooster making noise in the distance. Day trips are an easy drive to Florence, Pisa/Lucca, Siena, and other towns as well(the town is located near major highways). There is a well stocked local grocery only a few minutes drive from the villa, so you can cook in the well equipped kitchen, or eat in the local town, where there are good restaurants and of course, several Gelato stands! The pool is a good sized and is very clean, as is the entire property. And you must try the wine from the villa as it was excellent. We will remember our stay at Podere La Villa for many years to come, and would highly recommend it to anyone looking to get away from the hotel scene, and have a wonderful/comfortable time in Tuscany! Lovely place, lovely location, lovely family, lovely time! The dream of Tuscany is live here! CLEANING FEE: € 200 TO BE PAID AT THE END OF THE STAY, POSSIBLY IN CASH TOURISM TAX: € 1.50 PER PERSON PER NIGHT, CHILDREN DO NOT PAY UNTIL 14 YEARS OF AGE - PAYABLE FOR A MAXIMUM OF 7 NIGHTS WASHING MACHINES: TWO LOADS FOR FREE, THEN € 5 PER LOAD We can rent from March to end of April on a monthly base, please contact us for requests.